Also, any vocabulary words or questions for reflection can be written on sticky notes and attached to the corresponding pages within the book. That way, they are right there as you read each page. Read aloud the “Author’s Note” inside the book to the class while author’s picture is displayed. Begin reading the book aloud to students and share the following vocabulary words/terms, ask the following questions, and discuss. Page 2 – Vocabulary check: What is it called when someone is told that they can’t do something because of the color of their skin?” Explain or revisit the term “Jim Crow laws” and its general definition. How did the author’s parents react to what they saw on television? What did the mother mean when she declared “we have to go home” while standing in their house? How do you think you would react if you were in that family’s situation? Where did the author say the heart of the civil rights movement was? Why do you think the author made a point to tell us what color the table cloths were in the restaurant? Do you think that is important to know? Who do you think Uncle Martin is? This is the first time in the story that the author tells us of a happy experience that she had as a little girl. Based on evidence in the text, how do we know it was a happy experience for her? What factors do you think helped to make this a happy experience for her? Are the people she calls Uncles and Aunts related to her? How did eating at friends’ houses make her feel like a big family with them? ​What were they planning at dinner that evening and specifically, what was the purpose of the march? Had they been successful at previous marches? Why do you think they had not given up? What does the author compare the people’s voices and conversations to? (Ask students if they have ever heard a music concert or orchestra play, then explain what it sounds like when each instrument is tuning before the music begins. You can play this sound clip for them: http://www.orangefreesounds.com/orchestra-tuning/ so they can hear it for themselves. Why does the author’s mother say that women would be the key to any march’s success? What do you think Uncle Martin was thinking while “he sat silent and listened”? Ask students to remember that the author’s mother said that “women would be the key to any march’s success” on a previous page. Who is doing the work to set the table, cook the food, and bring it to the table and how does this relate to the mother’s comment about women in the march? Show the illustrations on pages 23 and 24 to demonstrate that the author and her sisters are smiling and happy to help. Based on information in the text, what does the author say the food and company do for them? 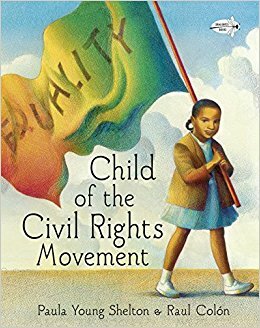 The author mentions several states that her father visited during his trips for equality for African Americans: Alabama Mississippi, Florida, and Georgia. What region of the US are these states located in? What does the author say were some of the things her father was doing while away in these states? Do you think this was dangerous? Why do you think it was important to the author’s mother to march with her husband (the author’s father)? In what ways could they place themselves in harm by participating in the march? What would you have done if that was your family and your children? Who else did the author discover was attending the protest march? Do you think she was surprised by this? Why or why not? Based on evidence in the text, what was the mood at the march? How long did it take for the protesters to march? How far was the march between the two cities? Why was the National Guard there? This march was broadcast, or shown, on television. Do you think that had any affect on the outcome of the march? What does the author say she remembered from the march? As result of that march, what happened in the legal system by President Johnson? What does the author say about how she feels to have been a part of that march? When the author writes that “they have won one battle but there were many more to come,” what does she mean? What does the author mean when she says that “one day . . . the baton would pass to us and we would march on – children of the civil rights movement?” In your opinion, do you think the civil rights movement is still happening or is it over? Upon completing the story, you may wish to point out that all the people mentioned in the story were real. There is a short biography about each person on page 40 that can be shared with students, if you choose. I recommend previewing (well in advance) your selection of magazines for young adult and adult themed articles and photographs BEFORE offering them to your students. Remove any inappropriate or questionable content (articles and photos) or pre-select a large group of photographs from the magazines that you will allow them to use. Ask students to reflect back to the cover of the book and what was written on the flag. Ask them to take a few moments to think about what the word equality means and what it personally means to them. Each student receives a piece of card stock, scissors, and a glue stick. Their activity is to find text, pictures, and/or photographs from the magazines that represent equality to them. They are to cut the objects out and paste them to the card stock to make a personal collage. Encourage them to be creative with the pictures/text they select and how they arrange them in their collage. NOTE: I will accept almost any picture/text on their collage as long as they can explain to me how it reflects equality in a personal way. You never know how our children will interpret what equality visually means to them. A picture of a hot dog could mean being able to cook out with family and friends, the freedom to attend a sporting event, or just to be able to safely go into a restaurant to buy a hot dog. Upon completion of their post-lesson activity, ask for student volunteers to share with the class their thought processes while they were creating their collages and explain how their objects symbolize equality to them.